LOS ANGELES, June 24, 2016 — Haier, a global appliance brand focused on whole-home solutions for modern living, is showcasing Small Space Living solutions at Dwell on Design LA, the largest design industry event in the U.S.
Haier appliances, electronics and ductless air conditioners have been incorporated into the design of a unique container home from Cocoon9. Cocoon9 delivers prefab, plug-and-play houses—tiny, modern homes with quality construction, high end finishes, smart technology, energy efficiencies, and versatile spaces, delivered fully assembled, on-site in four months. Haier’s small space freestanding and built-in kitchen appliances, including true European convection ranges and wall ovens, are designed specifically for kitchens in urban condos, small houses and micro-spaces. By providing standalone and bundled solutions designed to enhance day-to-day experiences in compact spaces, Haier recognizes—and celebrates—the increasing consumer shift to smaller, urban living spaces. 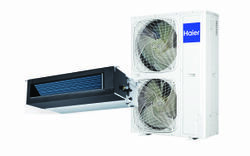 Haier America, headquartered in Wayne, N.J., is a subsidiary of Haier Group, the world's #1 major appliances brand by volume as ranked by Euromonitor International 2015, and a global leader in consumer electronics. Haier employs more than 60,000 people around the world and distributes products in more than 100 countries and regions with global revenues reaching over $30 billion in 2015. For more information, please visit www.haieramerica.com or connect at www.facebook.com/Haieramerica and Twitter @haieramerica.